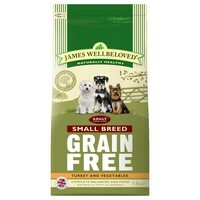 James Wellbeloved Grain Free Adult Dog Small Breed (Turkey & Vegetables) is a complete dry hypoallergenic food, formulated without cereals and designed for dogs with smaller mouths. Made with a selected protein source of Turkey and selected carbohydrate sources of pea and potato, the food is a dietetic recipe and is excellent for the reduction of ingredient and nutrient intolerance. James Wellbeloved Grain Free is completely natural and contains no wheat, barley, oats, maize or rice. It contains no added artificial colours, flavours or preservatives. Turkey Meal (25.5%), Pea Starch (25.4%), Potato Flakes (25.4%), Tomato Pomace (5.1%), Turkey Fat (4.2%), Whole Linseed, Turkey Gravy (2.9%), Peas (2.7%), Alfalfa Meal, Carrots, Seaweed (0.5%), Chicory Pulp, Pea Fibre, Omega Supplement*, Potassium Chloride, Sodium Chloride, Parsley (0.125%), Nettles (0.125%), Chicory Extract (0.1%), Taurine (0.1%), Calcium Carbonate, Glucosamine (0.045%), Yucca Extract (0.02%), Chondroitin (0.005%). My small 5 yr old cross loves this food. She was once very itchy and I found cutting out the rice improved this problem.